Grand Jury Indicts 2 Relatives Of Venezuela's President In Drug-Smuggling Case : The Two-Way The two men were arrested in Haiti and accused of trying to transport cocaine into the U.S.
Venezuelan President Nicolas Maduro, shown at a summit in Saudi Arabia on Wednesday, declined to answer reporters' questions about the arrests Tuesday of two of his relatives. The indictment says the two men participated in an October meeting to discuss shipping cocaine into the United States via Honduras. They were arrested in Haiti on Tuesday and flown to New York, according to the U.S. Attorney's office in the Southern District in New York. The men were traveling on diplomatic passports but don't have diplomatic immunity, according to Michael Vigil, a former head of international operations at the Drug Enforcement Administration, who was said to be briefed on the matter. Vigil was quoted by The Associated Press. 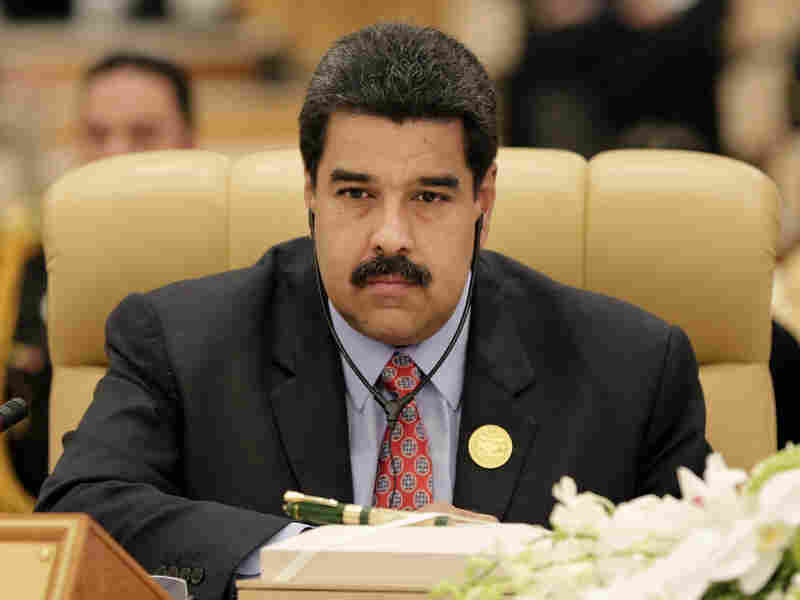 Campo Flores, 29, is the nephew of Cilia Flores, the powerful wife of President Nicolas Maduro. The second man also identified himself as the first lady's nephew. The Wall Street Journal reported that the men had contacted a DEA informant in Honduras and asked for help transporting the cocaine. They later brought a kilogram of cocaine to show an informant, in a meeting that was filmed and taped by DEA agents. "The arrests of the two men come as prosecutors in New York, Washington and Miami are pursuing numerous investigations into alleged drug-trafficking and money-laundering activities of top Venezuelan military, police and government officials, according to U.S. officials. "U.S. officials have long said Venezuela is the main transit point for cocaine from neighboring Colombia. Caracas routinely denies allegations that it is involved in drug trafficking, characterizing them as efforts to destabilize Venezuela's leftist government." Maduro, who succeeded the controversial Venezuelan leader Hugo Chavez, spoke at a United Nations conference in Geneva on Thursday. He did not address the arrests and would not answer reporters' questions. The arrests come at a difficult time for Maduro, who faces parliamentary elections in December. With public anger rising over the state of Venezuela's economy, Maduro's ruling socialist faced the possibility of losing power for the first time in 16 years.